Is There an Ivy League Advantage? I attended a bare-bones state college in upstate New York. The buildings and dorms were constructed in the style of Cement Block Modern. The students were rough around the edges; many were first generation college kids from Long Island or upstate New York. One friend's dad was a cow farmer. Another's dad was in construction. Over the summers, my pals would go home to summer jobs that involved pool cleaning or making pizzas. Occasionally, I would visit my high school pals who went to loftier institutions. The names of these schools had been proudly decalled onto the rear window of their parents' BMWs. I remember visiting my friend, Sue, at Harvard. A group of guys wearing tuxes strode through the campus confidently. She introduced me to her friends who had famous parents. Everybody looked more beautiful and polished than my ragtag group of friends at SUNY-Binghamton who had perfected grunge-wear a few years before Nirvana. 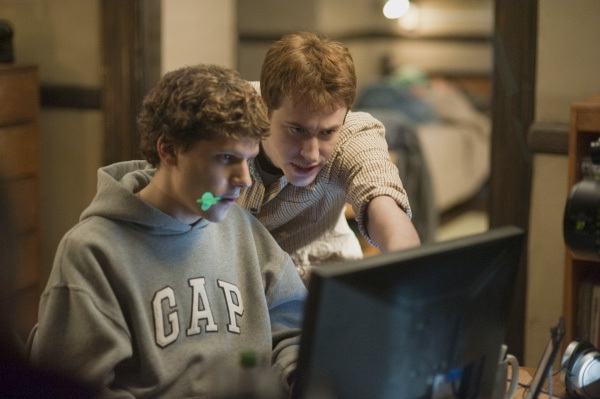 With the release of The Social Network, many are debating the Ivy League experience. Is Harvard really a land of elite WASP privilege? Nathan Heller at Slate says no and that the movie got it all wrong. Maybe Sorkin overstated the WASP-ish world at Harvard, but there is still something about those schools that breeds privilege. Heather Horn at Atlantic Wire points to a chart that shows that there is a correlation between income and attendance at higher ranked colleges. Without any direct experience at Harvard, other than a weekend visit or two, I really can't weigh in on this discussion, but I find it fascinating. I like the Heller article. I’m intrigued by the Horn article, except for the fact that I detest graphs like that without more information. What’s being plotted as the USNews rank of college — the rank in the year the person graduated, or the rank when they’re 28? Are the earnings inflation adjusted (or, alternatively, if that’s irrelevant, because all the data came from a particular year in which the graduates were 28, in what year were they calculated)? Are the points averages of all the students who went to that college (well, almost certainly not) but then, which set are they? the employed ones? the ones not in school? What’s the standard deviation? And, that train of thought was started by the fact that if my data point was included, it would be off the charts (since at 28, I was earning less than 40K, and earned my undergraduate degree at a place that would have been solidly in the top 10). And, re Heller’s article: I’ve spent a lot of time as an “outsider” from the hallowed halls of academic institutions (from high school on) that were formerly populated by the “waspy” elite. My experience is Heller’s. But, I’ve since recognized that part of that experience depends on the personality of the outside observer. There are people who notice (and feel left out) when their tie, or their bag, or the cut of their jib is “wrong” (with wrong being determined by their choice of comparison group). There are people who don’t (or look at a completely different peer group). I have no personal experience with undergraduate Harvard, but my guess is that Heller and someone else could have gone to the same Harvard, and came out of it with different impressions of the penetration of the “old Harvard” into new life. (and “outside observer” means someone who would not have been welcomed in those hallowed halls 50, or 100 years ago). My sister went to Harvard. I went to a small liberal arts school that most of you have never heard of. As far as classroom instruction, there was little difference between our two schools. I had much more contact with my professors. Her Harvard peers had aspirations that some of my first-generation friends have never even heard of. Many of my friends got prestigious jobs and went to top-rated graduate schools but many continued waitressing or otherwise for a year or so after college. We never saw the corporate recruiters that the elite schools or top-ranked state schools see. My take-away is that the opportunities are there for those from the lesser-ranked schools, but only if they know they exist and use their own resources to go after them. Of course, this is just one person’s experience. There’s a lot of privilege associated with attendance at Yale and Harvard, but it isn’t usually very well-portrayed in popular culture. It isn’t a ethnic or cultural sort of privilege; it’s the meritocratic privilege of late 20th century capitalism. Americans in general lack the vocabulary to express populist resentment of this privilege. Working class people often express it as hostility to “rich kids.” Jews and Catholics fall back on their familiar tropes of religious resentment. Neither of those rhetorical styles really captures the resentment felt by many against those who receive a head start in the quest for power and money because of their high SAT scores (or, more properly, their possession of the qualities measured by SAT tests). I remember after the whole Duke Lacrosse scandal, reading an article in The Rolling Stone about how wealthy the kids were, the top four sororities, the privilege, the clothing labels, etc. I felt like I was reading about some other university. Did the uber-rich exist? Certainly. Many, many people were from upper-middle class communities. But so many others were just scraping by in their 5-year old TJ Maxx jeans and work-study programs. There’s an economic dichotomy that’s very pronounced at these elite colleges, I think. I don’t know whether Ivy League educations are worth what they cost nowadays. When I graduated in the mid-90s, my college was very, very expensive– but it’s twice the cost now. We have the Hope scholarship here in Georgia — students with B averages in high school get to attend college tuition-free. If my kids are lucky enough to get into Georgia Tech or the University of Georgia (which are very, very competitive since the inception of the Hope scholarship), I won’t think twice about them not attending my alma mater. Yikes, Heller’s article was numbingly dull: “only I know the real Harvard in the ‘aught’ decade.” Ho-hum. And, his perspective is so narrowly jejune. Denby is about 67, Dargis about 48. Heller is what? 27 or 28? I have not seen the movie, but I glean that what it was trying to do, and did successfully, was to show that Harvard was and continues to be an institution that both signifies and functions as a device for sorting of college students into social sub-categories. Yes, all Ivy students are bright and all are very likely to succeed professionally. But there are gradations of success. Membership in certain sub-categories affects the level of certainty about the *degree* of success. At Harvard, Heller was a ‘student publications’ guy. That virtually guaranteed that he would eventually enjoy the privilege of writing ‘sour grapes’ commentary articles for a publication like Slate. He enjoys some nice remuneration and power, but no doubt both are fairly modest. He dismisses the final clubs at Harvard, which sound like Yale Secret Societies. Yes, such clubs have changed. Harvard no longer ‘officially’ recognizes them. And Skull & Bones is no longer all-male or all-white. Yet they still exist, and other subgroups abound on Ivy campuses. They confer on members the very highest levels of certainty about attaining great wealth or power or both. Heller explains that he was not pre-sorted into such a category while at Harvard, and it appears that his lack of perspective and sophistication are unlikely to get him there after the fact. Maybe he doesn’t want to be there, but the founders of Facebook clearly had other ideas. Some of your questions are answered if you follow the links (2007, to the one above). This is true even at those elite institutions. I was at Stanford for three years before I had any idea that such a thing as investment banking existed. I never tried, but I’m pretty sure by the time that world was on my radar screen, my lack of business electives, case study prepping on the side, etc. had already rendered me incapable of obtaining one of those summer internships, which you almost certainly need to get the full-time offer. Business courses are hardly a prerequisite for a job at an investment bank, if you have a degree from Stamford. Most top universities disdain those kinds of courses anyway. Now if you didn’t take any math or science or economics courses, that might be a problem, but if you didn’t take any of those courses for their own sake, it’s unlikely that investment banking is the right field for you. I remember the culture shock of realizing that non-Mormon DC college guys really do wear button-down shirts in their free time. realizing that non-Mormon DC college guys really do wear button-down shirts in their free time. It was well after college, but once I realized how much drunker you had to be to get a drunk and disorderly arrest wearing a button-down shirt, I always wore them when going out. What is the adjusted per-capita median family income of students at ivy league schools? What is the adjusted per-capita median family income of students at “elite” liberal arts colleges like swarthmore? I don’t think the advantage is necessarilly because a young person went to an elite accademic institution. They have an advantage because they had wealthy parents, didn’t have to work when they were 16 years old, and had a personal tutor. Privilage is the secret ingrediant. Very true, but such ‘out-of-the-gate’ privilege is reinforced by attending an Ivy or other elite school. I know, because I see the super super rich in NYC nonetheless obsessing because, even for them, admission to the Ivy League has become slightly less certain. And they know that there is a benefit to four young adult years spent socializing with others like them, which will also allow meeting the tiny number of ‘diverse’ smart people permitted crack into this small circle of privilege (e.g. Obama types, Zuckerman types). It’s all about continuing to try to claim that the institutions are meritocratic. One small consolation is that almost every student attending such an institution gets a very fine education, and a lifetime boost in income. I think the biggest advantage comes from being around the 10-20 percent of students who are phenomenally smart or phenomenally good at something like music or computers. I’m thinking not just of people like Zuckerman, who have extremely marketable skills (think of how his friends the programmers benefitted from being there with him) but also some students I TA’d at another Ivy league school who just blew me away, both in terms of intellect/talent and in terms of how much they’d accomplished and how hard they were willing to work. I have no stake in saying this place was meritocratic, but I don’t think the number of “diverse” smart people was “tiny.” It was a substantial chunk of the student population; and I think the next tier of smartness was pretty diverse too. Yes. And I can say now, 20+ years later, that the hackneyed “old boys network” emerges for everyone as everyone gets older. You run into classmates everywhere, and in certain professional fields, it can be an advantage. Not a huge advantage, but an advantage nonetheless.